Movie-star glamour meets fun in the sun: Roomy leopard-print shoulder tote comes complete with coordinating pillow and roll-out bamboo mat. A must-have by the pool or for your next beach outing! Magnetic snap closure; inner pocket for small items. 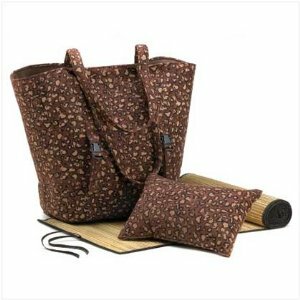 * Polyester fabric bag and pillow; bamboo mat.